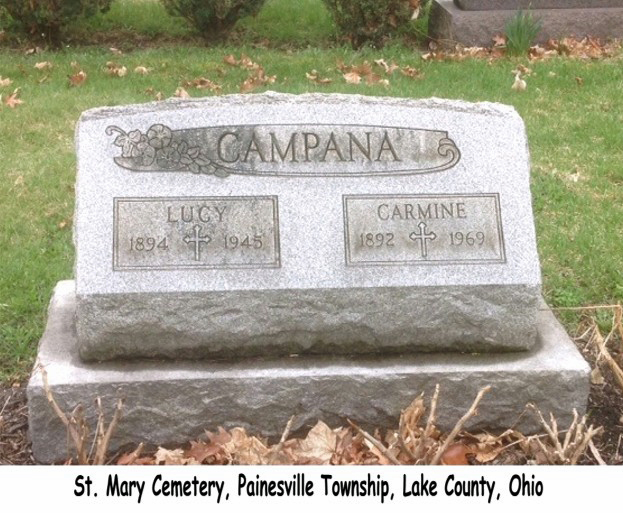 Carmine Campana first appears in the Painesville, Ohio, area in 1915. In America, Carmine Campana was known as Carmine Campana. Carmine Campana, son of Michele Campana and Angelantonia Iannantuono, was born on September 21, 1892, at Casalciprano, Italy. He married Lucia Battista, daughter of Pasquale Battista and Maria Angela Fortunata, on December 3, 1916 at St. Mary Catholic Church, Painesville, Lake County, Ohio. Carmine died on February 26, 1969, at his home, 485 Henry Street, Painesville, Lake County, Ohio, at age 76. His body was interred at St. Mary Cemetery at Painesville Township, Lake County, Ohio. Carmine Campana, age 18, immigrated to the United States on March 2, 1911, travelling to Erie, Erie County, Pennsylvania, joining his brother, Nunzio Campana. He was accompanied by his brother, Pasquale Campana. Carmine Campana established residence in Painesville, Ohio, about 1915. He became a citizen of the United States on February 3, 1944. Carmine resided at 485 Henry Street, Painesville, Lake County, Ohio, when he was naturalized. Carmine worked as a nurseryman for 40 years.